An innovative press system for air-conditioning and refrigeration applications up to 48bar (700 psi). 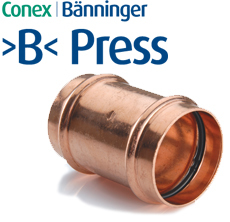 Benefiting from over 100 years’ experience in fittings manufacture and over two decades in press system design, Conex Bänninger presents >B<MaxiPro, the latest in flame-free, press fitting solutions. 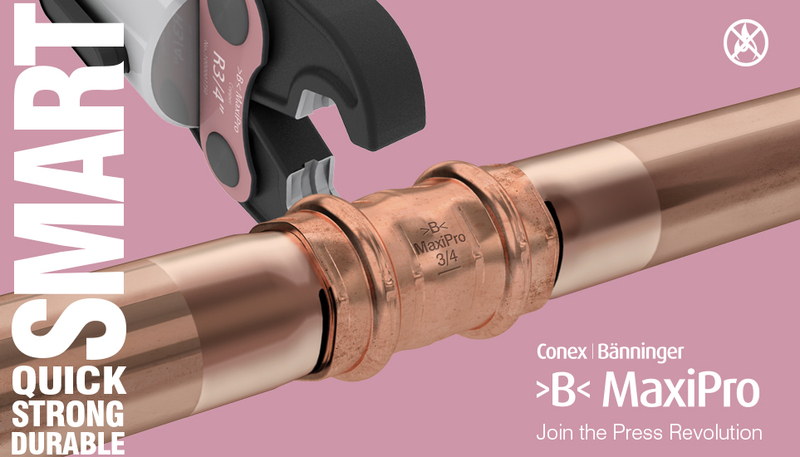 >B< MaxiPro is set to revolutionise pipe jointing in air conditioning and refrigeration applications. Specially designed in collaboration with Conex Bänninger, the Rothenberger Romax Compact Press Tool (Romax 4000 Press Tool) and >B< MaxiPro jaws are the recommended tools to fit >B< MaxiPro to a professional standard. >B< MaxiPro is quick and simple to install and significantly improves productivity through greatly reduced installation time.